Long Road From Sheridan to Rock Island. "I just walked in from Sheridan, and boy, are my arms tired." 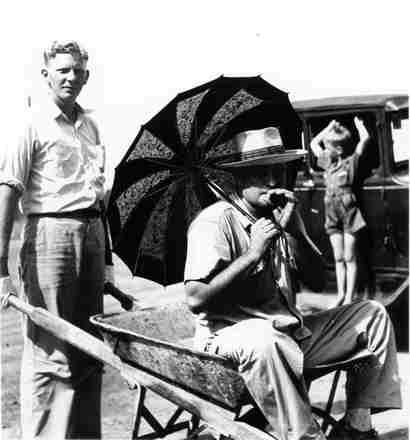 "H. E. Griffith, in wheelbarrow, being pushed from Sheridan to Rock Island* by Oscar Houchins, August 24, 1942. Houchins had lost a bet to Griffith on the governor's race. Large crowds gathered in Sheridan and Rock Island to see the departure and the arrival. The photograph, taken at Sheridan just before the two men departed, ran in the Colorado County Citizen of August 27, 1942." *Distance from Sheridan to Rock Island is roughly 6.7 miles.